Among the 23 players, twenty play for foreign teams outside Brazil and six also played in the 2014 World Cup. RIO DE JANEIRO, BRAZIL – With a little over two months before their first game in this year’s World Cup in Russia, Brazil has announced its 23-player team. 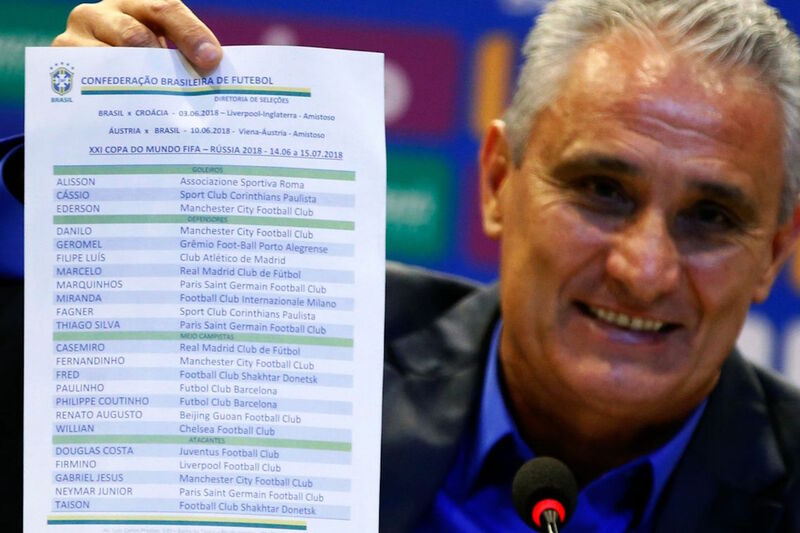 Brazilian soccer coach, Tite, read off the names on Monday afternoon to a room full of reporters of those who will be part of Brazil’s Seleção (National Team). Brazilian soccer coach Tite, announces players for 2018 World Cup in Russia, photo by Fernando Frazão/Agencia Brasil. The coach said his choices for the team were based on individual characteristics of each player, not giving into pressure from clubs or fans. “Consistency of career; of work within the national team and within their own clubs,” said Tite before announcing players’ names. Among the twenty-three players, twenty play for foreign teams outside Brazil and six also played in the 2014 World Cup, held in Brazil. Some names, like Neymar, Gabriel Jesus and Thiago Silva were already expected by sports aficionados, but there was some criticism of the coach for leaving out names like Luan and Arthur. “Great choice for the World Cup, but forgot Luan”, wrote Henrique Ludwig in his Twitter account. Others were not as pleased. “Tite erred in his choices, the team won’t make it to the quarter finals,” wrote Tiago Scotti on his social media page. Brazil’s President, Michel Temer, also weighed in “We already have the selection for the World Cup in Russia. Now, Tite and staff, with all respect to our Russian hosts and friends, please bring the Cup home,” President Temer said on his Twitter account. the 27th the team goes to the U.K. where it will train at the Tottenham football club center. Brazil will play its first game in the World Cup on June 17th against Switzerland.